This quick start guide will help you to get up and running with common optimization problems. Consult the subsequent chapters of the online documentation for more in-depth information. We allow a solution in the whole definition space (R2). No restriction (constraint) exists. Therefore, this problem is an unconstrained optimization problem. Read more about handling unconstrained problems here: Unconstrained Optimization. Specify a starting point to begin searching for the minimum. Similarly, upper bounds for each dimension can be specified using the upperBound parameter. The constrained solver is capable of handling bound constraints, equalty and inequalty constraints. Maybe the most popular application for nonlinear least square problems is data fitting. 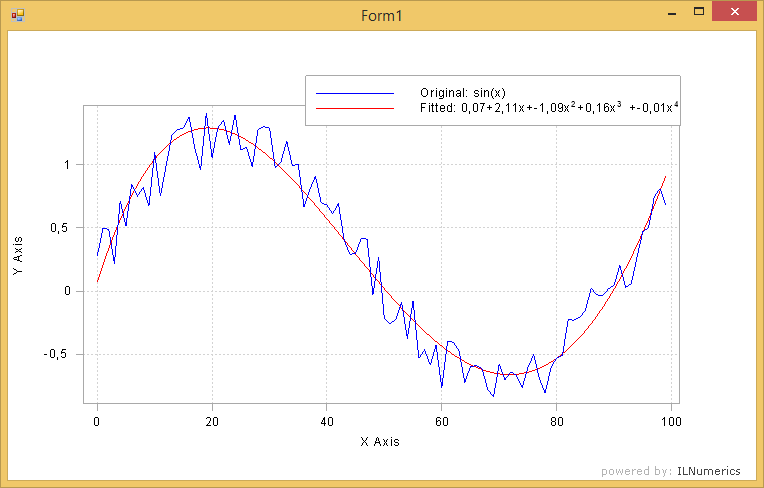 The following complete example fits a polynomial model to data values created from a sinosoidal function (with some noise). The example is also found in the example projects section. Read more about Nonlinear Least Squares methods in ILNumerics. ILNumerics Optimization Toolbox is available for individual purchase.